With streamlined and faster-than-ever services, the internet era has certainly made our lives faster and easier. However, challenges such as rigid data accessibility, security breaches, high dependency on centralized domains, etc., restrict and hold back our digital growth Today’s internet will benefit immensely from decentralized technology that are capable of offering more flexibility and security to users to operate digitally. 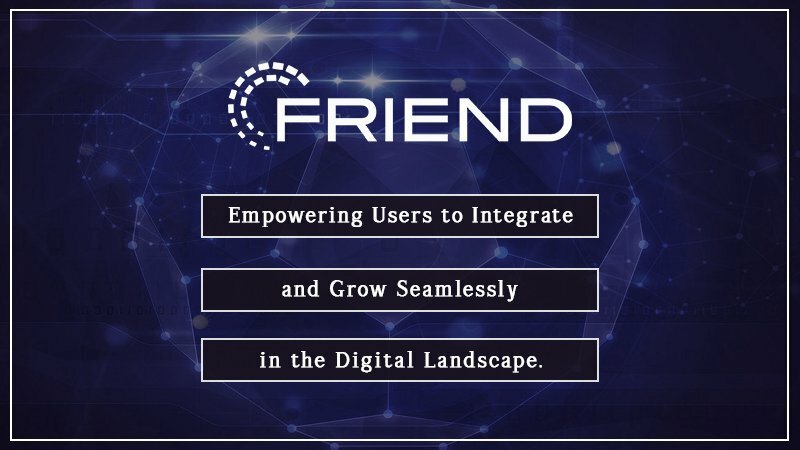 Friend is an open source community created within the blockchain domain, that has identified and delivered the aforementioned needs and thus offers an easy-to-use network, where users hold full control over their data. By placing the power of data in the hands of users, The Friend Internet OS and Friend Network allows individuals to develop digitally without depending on centralized networks. It is the world’s first Internet OS truly implementing liquid computing* that provides its user’s a digital space that can be accessed from anywhere across the globe. The Friend Internet OS is an autonomous cloud computer managed by its users, where they can transfer files, run apps, and add new storage to earn FRND tokens. The ”Friend Core” is the technological masterpiece in at the heart of the unique Friend operating environment that manages the server side and encrypted connection between servers and clients. It also handles the resources and user sessions that are available on the server, and simplifies it through a standard command set. Furthermore, the Friend Core is dominantly written in C language, which is lightweight and fast, allowing speed and flexibility specifically designed to handle requests on the imminent launch of the ground breaking 5G network with a 2 ms response time. Friend Network will be a vast decentralized network crammed full withstate of the art highly effective resources and services. The robust Friend core servers, computing power, bandwidth and storage space, allows users to create their own infrastructure where freedom and privacy are central facets. The Friend Internet OS offers capability of creating a personal virtual computer that is available anytime and anywhere. Additionally, the Friend Workspace enables users to access the entire network with ease via a desktop or mobile device. The Friend Internet OS – is a Cloud Computer that can also be expanded with new disks, services, and applications from the Friend Store. With Friend, users have the opportunity to select the storage provider of their preference and connect with services like Dropbox, Google Drive, IPDB, IPFS, etc., along with a built-in storage of the Friend node. The storage drivers are open source and integrated with a standardized interface. Additionally, the network uses client-side encryption for authentication. It also offers the ability to encrypt the data at rest through file system drivers. The Friend app framework is robust and incorporates all the features and functionalities that one would expect in a standard operating system plus considerably more. The Friend Workspace is a responsive desktop zone that offers seamless multitasking on a single tab, and runs on a modern standards-compliant web browser. While the applications are distributed separately, the Friend Workspace allows users to run multiple applications and services with a single sign-in. Friend is a THE Internet OS and is developed with an objective to provide a future-proof network that offers accessibility, reliability, and scalability. Its easy-to-use and powerful user interface allows users to efficiently share and gain access to data anywhere across the globe, and also earn substantial rewards in return via FRND tokens.